One of the most dangerous philosophical contentions even amongst liberty movement activists is the conundrum of government force and prevention during times of imminent pandemic. All of us at one time or another have had this debate. If a legitimate viral threat existed and threatened to infect and kill millions of Americans, is it then acceptable for the government to step in, remove civil liberties, enforce quarantines, and stop people from spreading the disease? After all, during a viral event, the decisions of each individual can truly have a positive or negative effect on the rest of society, right? One out of control (or “lone wolf”) citizen/terrorist could reignite a biological firestorm, so, should we not turn to government and forgo certain freedoms in order to achieve the greater good for the greater number? If the government in question was a proven and honorable institution, then I would say pro-Medical Martial Law arguments might have a leg to stand on. However, this is not the case. In my view, medical martial law is absolutely unacceptable under ANY circumstances, including Ebola, in light of the fact that our current government will be the predominant cause of viral outbreak. That is to say, you DO NOT turn to the government for help when the government is the cause of the problem. The recent rise of global Ebola is slowly bringing the issue of medical martial law to the forefront of our culture. Charles Krauthammer at The Washington Post recently argued in favor of possible restrictions on individual and Constitutional liberties in the face of a viral pandemic threat. The Obama Administration is now using militant terminology in reference to Ebola response, including the formation of “Ebola SWAT Teams” for quick reaction to potential outbreak areas. In typical socialist fashion, the nurses union ‘National Nurses United’ has called for Barack Obama to use “executive authority” to take control of all Ebola response protocols in hospitals across the country. Yet another perpetuation of the myth that more government power is the solution. And finally, the Department of Defense has been tasked to create a military controlled “quick-strike team” to deal with Ebola within U.S. borders. This team will be under the command of none other than Northcom, apparently trampling the Posse Comitatus Act and setting the stage for the rationalized use of military personnel against U.S. citizens under the guise of pandemic prevention. It should be clear to anyone with half a brain that medical martial law is being quietly prepared, and that the threat of such measures is not a paranoid conspiracy, but a very real possibility. It should also be noted that such provisions are not only the products of the Obama Administration. It was George W. Bush who first created laws intersecting with the World Health Organization’s pandemic preparedness planning. These laws include the “overrule of existing legislation or (individual) human rights” in order to quell a viral outbreak, and were originally drafted around the potential of an influenza crisis. It is this kind of executive overreach that has set precedence for states such as Connecticut toannounce a tentative state of emergency with medical martial law restrictions. I discussed in great detail why Ebola works in favor of establishment elites in my article ‘An Ebola Outbreak Would Be Advantageous For Globalists’. Understand that bureaucrats will come to you with promises of offering a helping hand, hoping that you are afraid enough to accept, but their intentions will not be compassionate. Rather, their intent will be to assert as much dominance over the public as possible during the chaos, and to erase any conception the people may have had in the past that they have inalienable rights. But going beyond the hidden motives of tyrants, I think it is important to point out that the Center for Disease Control and the federal government in general has already lost all credibility in dealing with Ebola, and therefore, it has lost any authority it may have had in administrating a future response. Ebola has been officially known to the CDC for over thirty years. Why has the CDC refused for three decades to produce proper care guidelines for hospitals? Medical staff in the U.S. didn’t even receive guidelines when the outbreak in Western Africa was obviously progressing out of control. Why did the CDC leave Thomas Duncan, the very first U.S. Ebola case, in the hands of the Texas Health Presbyterian Hospital, without proper procedures in place to prevent further infection, and without a CDC team present? The CDC has an annual budget of nearly $7 billion. Where is all of this money going if not to stamp out such threats as Ebola? The argument presented by the White House, the CDC, and even the World Bank, has been that stopping direct or indirect travel from nations with an Ebola outbreak would be “impractical”, and that such travel bans would somehow “make matters worse”. They have yet to produce a logical explanation as to how this makes sense, but what if we did not need to institute a travel ban? The CDC, with it’s massive budget, could easily establish quarantine measures in infected countries. Anyone wishing to travel outside of these nations would be welcome to do so, as long as they voluntarily participate in quarantine procedures for a set number of days. No quarantine, no plane ticket. Where has the CDC response been in Western Africa? Why has the White House nominated Ron Klain, a man who knows absolutely NOTHING about Ebola or medical emergency strategies, as the new “Ebola Czar”? Why has all discussion on Ebola prevention revolved around government measures rather than community measures? Why has all talk centered on what the government will do AFTER an outbreak occurs, rather than on what can be done to prevent an outbreak in the first place? The reality is that the federal government does not have any treatments for Ebola that are outside of the knowledge and capabilities of the average medically trained citizen. Meaning, the government and the CDC are NOT needed for a community to handle an Ebola outbreak, if that community is given proper guidelines and strategies in advance. Treatment for Ebola, at least in first world nations, consists primarily of regimented transfusions. These transfusions are a mixture of isotonic saline, electrolytes, and plasma, designed to keep the body supported until its immune system can build up a proper defense to the virus. Natural and homeopathic methods can also boost immune system functions making the body resistant to the virus before it is ever contracted. The most effective of all treatments appears to be the transfusion of blood from a recovering patient with antibodies into a newly sick patient. This is likely the reason for the quick recovery of infected doctors like Kent Brantly. The CDC would never be able to coherently organize a large-scale program of transfusion initiatives, even if it wanted to. Most hospitals around the country have no isolation wards able to handle even a minor Ebola outbreak. The hospitals that do have facilities are limited to less than a dozen beds. According to the medical workers I have spoken with, most hospitals require a minimum of around 50 health professionals to deal with a single Ebola patient. In the event of an outbreak larger than a few people per state, the CDC and local hospitals are simply not equipped to react to the problem. Blood transfusions from recovering donors would be few and far between, unless organized by local citizens working under their own directives. Ironically, it was the Bush Administration’s own report in 2006 on the possibility of bird flu pandemic that admitted the government is completely unequipped to handle an outbreak of moderate size.The report stated that “all sources of external aid may be compromised during a pandemic,” and that “local communities will have to address the medical and non-medical effects of the pandemic with available resources.” Little has changed in the federal government’s pandemic preparations since the report was written. This leaves individual communities to either prepare for the worst, or die off while waiting for the government to save them. Self isolation and self treatment are the only practical options. The greatest danger to American citizens is, in fact, not the Ebola virus, but government reactions to the Ebola virus. Already, several medical outfits around the world are suddenly interested in producing an Ebola vaccination when no one seemed very interested before. This might sound like good news, until you learn the terrible history of modern vaccinations. Pharmaceutical company Merck was caught red handed faking vaccine efficacy data. Merck’s Gardisil was found to contain DNA fragments of human papillomavirus. GlaxoSmithKline, a major vaccine producer, has been caught repeatedly attempting to bribe doctors and health professionals into promoting their products or outright lying about their effectiveness. Glaxo was caught producing rotavirus vaccinations tainted with a swine virus in 2010. Glaxo has been caught producing vaccines tainted with bacteria and endotoxins. It is important to point out that Glaxo is also spearheading an Ebola vaccine initiative. U.S. company Baxter produced a flu vaccination in Austria tainted with both avian flu and swine flu. The mixture just happened to be randomly tested on a group of ferrets by a lab in the Czech Republic. The test animals died. The exposure of this “mix up” was quietly swept under the rug by Baxter and the mainstream media, but reports indicate that if the vaccine had been used on the general population, a terrible pandemic would have erupted. Beyond the fact that vaccinations have a tendency to cripple our natural immune system and infect patients with the very disease they are meant to prevent, none of these existing companies can be trusted to produce a vaccine that is safe even by traditional pharmaceutical standards (which are very low). If the CDC and the federal government trigger a medical martial law scenario, they will most likely include forced vaccination of the population to maintain “herd immunity”. The bottom line? The use of such vaccines will be a death sentence for many, a death more certain than the contraction of Ebola. In my opinion, Ebola vaccination should be avoided at all costs by the American populace. I can think of no rationale for government involvement in the treatment of an Ebola outbreak. If it is not pure incompetence on their part that has exacerbated the threat, then even worse, it is a deliberate program of genocide. In either case, no military or CDC “strike teams” should be allowed free reign in our neighborhoods, towns, counties, or states. DHS and FEMA Community Emergency Response Teams (CERT) are also a no go, given FEMA’s track record of dismal disaster response. They CANNOT be allowed to take control of our communities. The only way for Americans to survive such an event is to cut out government entirely and establish their own medical strategies, as organizations like the Oath Keepers Community Preparedness Teams (CPT) are doing. If someone wants to voluntarily go to the CDC or FEMA for assistance, then they should be allowed to take that risk. However, medical martial law over all of us in the name of the “greater good” should not be tolerated. The government has proven beyond a doubt that it is not qualified to handle a viral crisis scenario, let alone determine what the “greater good” actually is. 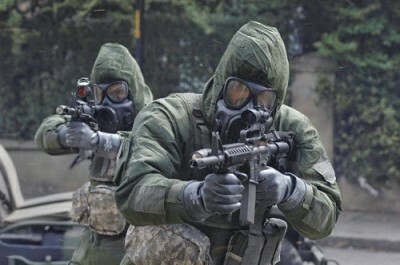 I can’t speak for the whole of the Liberty Movement, but as for myself, if a group of hazmat suited thugs decides to chase me down with a syringe, I am relatively certain none of them will live through the encounter. Will I be accused of aiding the spread of Ebola because of my non-compliance? Of course. Do I care? Not so much. Each individual American will have to make their own decision on this matter in due course. Is it better to conform and risk annihilation at the hands of an ignorant and/or corrupt government, or, to fight back and be labeled a bio-terrorist? With the clear lack of tangible government preventions for outbreak in the U.S., you’ll probably get your chance to find out soon enough.